Mason Hawkins’ 13F portfolio value decreased ~7% from $8.95B to 8.33B this quarter. The number of positions decreased from 28 to 27. Southeastern Asset Management increased General Electric and Realogy while dropping CONSOL Energy. The top three positions are CenturyLink, CNX Resources, and FedEx Corporation, and they add up to one-third of the portfolio. This article is part of a series that provides an ongoing analysis of the changes made to Mason Hawkins’ 13F portfolio on a quarterly basis. It is based on Hawkins’ regulatory 13F Form filed on 11/14/2018. Please visit our Tracking Mason Hawkins’ Southeastern Asset Management Portfolio series to get an idea of his investment philosophy and our previous update for the fund’s moves during Q2 2018. This quarter, Hawkins’ 13F portfolio value decreased ~7% from $8.95B to $8.33B. The number of holdings decreased from 28 to 27. The top three holdings are at ~33% while the top five are at ~47% of the 13F assets: CenturyLink, CNX Resources, FedEx Corporation, Mattel, and Park Hotels & Resorts. Southeastern is best known for its investor friendly attributes. The mutual funds in the Longleaf family are Longleaf Partners Fund (LLPFX) incepted in 1987, Longleaf Partners Small-Cap Fund (LLSCX) incepted in 1989, Longleaf Partners International Fund (LLINX) incepted in 1998, and the Longleaf Partners Global Fund (LLGLX) incepted in 2012. The flagship Longleaf Partners Fund had a 15.51% return in 2017. As of Q3 2018, the fund is up 2.70% compared to up 7.71% for the S&P 500 index. 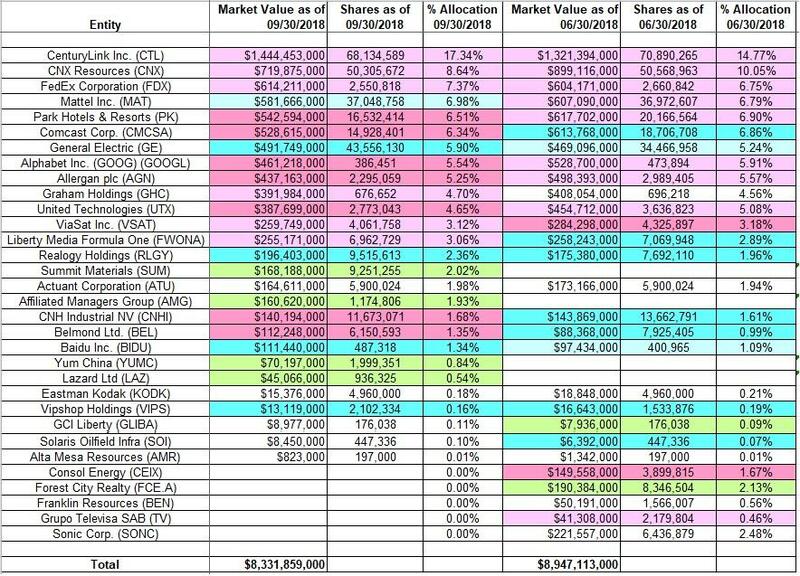 Although the fund is focused on US mid- and large-cap businesses, the current allocation has three non-US companies in the top ten: CK Hutchison (OTCPK:CKHUY), LafargeHolcim Ltd. (OTCPK:HCMLF), and Fairfax Financial (OTCPK:FRFHF). Cash allocation is at ~11%, down from ~23% as of Q4 2017. Although their mutual funds are well known among retail investors, it should be noted that the vast majority of Southeastern’s AUM is attributable to separately managed accounts. The characteristics that make the fund family distinct are elaborated in David Swensen’s (Yale Endowment) book “Unconventional Success: A Fundamental Approach to Personal Investment”. CONSOL Energy (CEIX): CEIX was a ~2% portfolio stake that came about as a result of the coal-spin-off from CNX Resources in November. Terms called for CNX holders to receive one share of CEIX for eight shares of CNX held. Regulatory filings showed them owning ~51M shares of CNX shares for which they received ~6.4M shares of CEIX. The stock started trading at ~$22 and has almost doubled with current quote at ~$35. There was a ~35% selling over the last two quarters at prices between $27.50 and $47.50 and the disposal this quarter was at prices between $38 and $47. Southeastern realized gains. Note: Southeastern had a ~14% ownership stake in CONSOL Energy. Sonic Corporation (SONC): SONC was a ~2.5% portfolio stake established in Q3 2016 at prices between $25.50 and $29.50. Q4 2016 saw a ~23% increase at prices between $22 and $28.50 and that was followed with a ~40% increase in the following quarter at prices between $22.50 and $27.50. The position was disposed this quarter at prices between $33.50 and $43.50. In September, Inspire Brands agreed to acquire Sonic Corporation at $43.50 cash. Note: Southeastern had a ~17% ownership stake in Sonic Corporation. Forest City Realty (FCE.A): FCE.A was a ~2% of the portfolio stake established last quarter at prices between $19.50 and $23 and eliminated this quarter at prices between $22.50 and $25.15. The stock is now at $25.27. In July, Brookfield Asset Management (BAM) agreed to acquire Forest City for $25.35 per share cash. Franklin Resources (BEN) and Grupo Televisa SA (TV): These are very small (less than ~0.6% of the portfolio each) positions disposed this quarter. Summit Materials (SUM), Affiliated Managers Group (AMG), Yum China (YUMC), and Lazard Ltd. (LAZ): These are the four new positions this quarter. The ~2% SUM stake was established at prices between $18 and $27 and the stock currently trades well below that range at $14.26. The ~2% AMG stake was purchased at prices between $137 and $160 and it is now well below that range at $109. YUM and LAZ are very small (less than ~1% of the portfolio each) new positions. For investors attempting to follow, SUM and AMG are good options to consider for further research. Note: Regulatory filings since the quarter ended show them owning 12.28M shares (11% of the business) of Summit Materials. This is compared to 9.25M shares in the 13F report. CenturyLink (CTL): CTL is currently the largest 13F position at ~17% of the portfolio. It came about as a result of the acquisition of Level 3 Communications by CenturyLink that closed last October. Southeastern had a huge 28M share stake in Level 3 for which they received ~40M CTL shares in the ratio 1:1.4286. The terms called for $26.50 per share in cash as well. The position was increased by ~75% in Q4 2017 at prices between $13.50 and $20.50. The stock is now at $17.88. There was a marginal increase in Q1 2018 and minor reductions in the last two quarters. For investors attempting to follow, CTL is a good option to consider for further research. Note: Southeastern has a ~6.5% ownership stake in CenturyLink. As of Q2 2018, they still believed CTL is selling for about half its appraised value. The stock was at ~$19 at the time. CNX Resources (CNX): CNX is a top-three ~9% of the 13F portfolio stake. The original position is from 2012 when ~25M shares were purchased in the high-$20s price range. Q4 2014 and Q1 2015 saw a stake doubling at prices between $24 and $39. There have been minor adjustments since. The stock is now at $13.51. Q1 2018 saw a ~3% increase while last two quarters saw marginal trimming. Note: The prices quoted above are adjusted for the coal spin-off last November. Southeastern has a ~23% ownership stake in CNX Resources. FedEx Corporation (FDX): FDX is a very long-term position that has been in the portfolio since 2000. Currently, it is a large stake at ~7% of the portfolio. Recent activity follow: Q3 2015 saw a ~24% increase at prices between $141 and $172. The five quarters through Q4 2017 had seen a combined ~50% reduction at prices between $170 and $250. The stock currently trades at ~$223. Q1 2018 also saw an ~18% selling at prices between $229 and $274. There was a ~2% trimming last quarter and a ~4% reduction this quarter. Park Hotels & Resorts (PK): PK, the December 2016 spinoff from Hilton Worldwide (HLT), is a ~7% portfolio position purchased in Q2 2017 at prices between $25 and $28 and doubled the following quarter at around the same price range. The stock is now at $30.20. Q1 2018 saw a ~180% increase in the mid-$20s price-range as they got a large allocation from a subscription sale by distressed Chinese conglomerate HNA who sold its 25% stake. Last two quarters have seen a ~22% selling at prices between $26 and $34. Comcast Corporation (CMCSA): CMCSA is a large 6.34% of the portfolio position purchased in early March in the low-$30s and the stock currently trades at $37.39. Last quarter saw a ~27% increase at prices between $30.50 and $34.50 while this quarter saw a ~20% selling at prices between $33 and $38. Alphabet Inc. (GOOG) (GOOGL): GOOG is a large 5.54% portfolio position purchased in Q1 2015 at prices between $492 and $575 and increased by ~50% the following quarter at prices between $520 and $565. Recent activity follow: last two years have seen a ~64% reduction at prices between $750 and $1,250. The stock is now at $1,024. Southeastern is realizing huge gains. Allergan plc (AGN): AGN is a fairly large 5.25% portfolio stake purchased in Q4 2017 at prices between $164 and $211 and increased by over one-third next quarter at prices between $144 and $188. The stock currently trades at ~$154. There was a ~4% trimming last quarter and a ~23% reduction this quarter at prices between $167 and $193. Graham Holdings (GHC): GHC is a 4.70% of the portfolio stake first purchased in 2013. Q2 and Q3 2014 saw a ~30% increase at prices between $286 and $360. The stock currently trades at ~$628. There was a ~7% trimming in Q4 2017 while next quarter there was a marginal increase. This quarter saw a ~3% trimming. Note: The prices quoted above are adjusted for the spinoff of Cable One (CABO) from Graham Holdings that closed on July 1, 2015. Shareholders of GHC received one share of CABO for each share of GHC held. Southeastern controls ~15% of Graham Holdings. United Technologies (UTX): The bulk of the current ~5% UTX position was purchased in Q4 2015 at prices between $88 and $101. Q1 2016 saw a ~30% increase at around the same price range. The stock currently trades at ~$129. Last two years have seen a ~58% selling at prices between ~$100 and ~$140. Viasat Inc. (VSAT): The ~3% VSAT stake was first purchased in Q2 2014 with the majority acquired the following quarter at prices between $54 and $59. Q3 2015 saw a one-third increase at prices between $56 and $64.50. There was a ~16% increase in Q1 2017 at prices between $63 and $70 and that was followed with an ~11% increase in Q3 2017. The stock currently trades at $67.72. Last four quarters have seen a combined ~30% selling at prices between $65 and $80. Note: Southeastern has a 6.8% ownership stake in ViaSat. Liberty Media Formula One (FWONA) (FWONK): FWONK is a ~3% of the portfolio stake established in Q2 2016 at prices between $17.50 and $20 and the stock currently trades well above that range at $29.74. There was a one-third reduction in Q2 2017 at prices between $30.50 and $37 while last quarter saw a similar increase at around the same price range. There was a ~2% trimming this quarter. Note: Following acquisition of Formula One, Liberty Media was renamed Liberty Media Formula One and the stock symbols changed. CNH Industrial NV (CNHI): CNHI is a 1.68% of the portfolio position built-up from Q3 2014 at prices between $7.50 and $10. Q2 2015 saw a minor ~5% trimming and that was followed by a ~16% reduction the following quarter at prices between $6.50 and $10. The pattern reversed in Q4 2015: ~18% increase at prices between $5.50 and $7.50. Last five quarters had seen a ~70% reduction at prices between $8.70 and $15.15. The stock currently trades at $9.51. Last quarter saw a one-third increase at prices between $10.50 and $13 while this quarter saw a ~15% selling. Belmond Ltd. (BEL): The small 1.35% BEL stake saw a ~22% selling this quarter at prices between $10.50 and $18.50 and the stock currently trades at $18.79. Mattel Inc. (MAT): MAT is now a large (top five) ~7% portfolio stake. It was established in Q3 2017 at prices between $14.50 and $21.50 and increased by ~250% the following quarter at prices between $13 and $19. The stock currently trades near the low end of those ranges at $13.44. For investors attempting to follow Southeastern, MAT is a good option to consider for further research. There was a marginal increase this quarter. Note: Southeastern has an ~11% ownership stake in Mattel Inc.
General Electric (GE) and Realogy Holdings (RLGY): These two positions were established in Q4 2017 and increased in the last three quarters. The ~6% GE position was established at prices between $17 and $25 and increased by ~185% next quarter at prices between $13 and $19. This quarter saw another ~26% increase at prices between $11.25 and $14.25. It is now at $7.57. RLGY is a 2.36% stake purchased at prices between $26 and $34 and increased by ~20% in Q1 2018. There was a ~18% increase last quarter at prices between $23 and $28 and that was followed with a ~24% increase this quarter at prices between $20 and $24. The stock is currently well below those ranges at $18.46. For investors attempting to follow Southeastern, these are good options to consider for further research. Baidu Inc. (BIDU) and Vipshop Holdings (VIPS): These small (less than ~1.5% of the portfolio each) stakes were increased this quarter. Actuant Corporation (ATU): ATU is a 1.94% portfolio stake established in Q3 2015 at prices between $18 and $23 and the stock is now at $24.94. Note: Southeastern has a 9.8% ownership stake in Actuant Corporation. Alta Mesa Resources (AMR), Eastman Kodak (KODK), GCI Liberty (GLIBA), and Solaris Oilfield Infrastructure (SOI): These are minutely small (less than ~0.2% of the portfolio each) stakes kept steady this quarter. Note: Southeastern has a 30.4% ownership stake in Eastman Kodak (11.5M of the 16.45M share stake is in preferred convertibles which is not listed in the 13F report). Disclosure: I am/we are long CNX, GE, TV. I wrote this article myself, and it expresses my own opinions. I am not receiving compensation for it (other than from Seeking Alpha). I have no business relationship with any company whose stock is mentioned in this article.